All those stories about cowboys, lawmen, and outlaws? Most of them occurred here, in the American Southwest. The people behind them have become legends, glamorized by Hollywood, stretched and exaggerated until they are hardly recognizable. Good guys never do no wrong and the bad guys are truly evil. 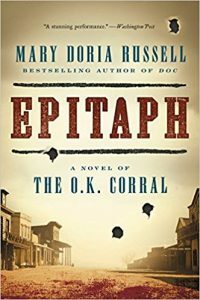 Life is never so black and white and Mary Doria Russell tries to put some human perspective on one of the most famous events of the old West, the gunfight at the O.K. Corral. Once the smoke had settled, three men had been killed. The Earp brothers, and their friend Doc Holliday, at most suffered relatively superficial wounds. 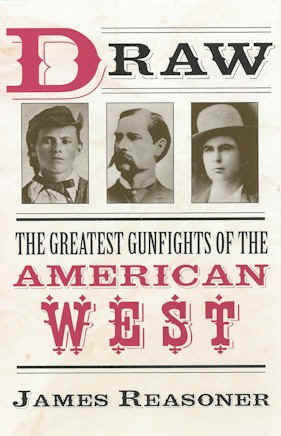 However, the controversy over who drew first, whether the dead men had even been armed, and the bad blood between the Earps and the so-called Cow Boys that boiled over led to the shooting of two of the Earps, one who died, and a vendetta ride by Wyatt Earp that cemented his place in American history. Epitaph is a novelization of the history of the gunfight. It begins in a seemingly unlikely place, with the childhood of Josie Marcus, who became Wyatt Earp’s wife and outlived them all. If there is a common thread that pulls the narrative together, it is Josie’s, but Russell does an excellent job of juggling a huge cast of characters and, more importantly, providing them with a voice. Even the most despicable of the so-called villains has his time on the page. Events are given view through the eyes of characters not directly involved in the gunfight, such as the wives of the various Earp brothers. Russell doesn’t lay blame for the gunfight at the foot of any one character. Rather, she tries to provide context for the events as they unfold and maybe some rationale for those events. Being a novelization, Russell certainly takes liberties. There are quiet moments where she fills in the blanks. There are events where we don’t know enough to be certain what really happened — Russell adds her own details. And there are contradictory accounts, for example, how Josie originally left her family and found herself in Tombstone, Arizona. Russell chooses one of those stories, the one told by Josie herself, and uses it as if it were canon. One of the Earp brothers, Warren, never makes an appearance. I’m not enough of a historian to really judge the historical accuracy of the events as Russell conveys them. However, it seems she has a solid skeleton based on history and her details add the flesh that lead to a great story. Maybe I learned something from this book about the history of the American Southwest. Certainly, names and places that dot our collective consciousness are given meaning: Doc Holliday, Albuquerque, Tombstone, Wyatt Earp. And new details arise that pique my interest, such as the fact that Earp spent some time in Idaho, in Eagle City. Other characters emerge as important players in the drama of Tombstone, including the other Earp brothers and John Behan, a would-be political mover and shaker whose life is very much intertwined with those of Wyatt and Josie. Even though Russell may have taken liberties with some of the details, the story moves along and keeps you engaged. I’m keen to read more about the men and women of the American Southwest and that is as great a testament to a book like Epitaph as I can make. The Wild West is one of those times and places that pulls strongly on our imagination, with images of danger, adventures, and freedom. Daring bank robberies, shoot outs, posses chasing outlaws through the wilderness, saloons and gambling. Men such as Billy the Kid, Wild Bill Hickock, Wyatt Earp, Bat Masterson, Doc Holliday. These are the icons of the Wild West. Typically, however, we have next to no real inkling of the real Wild West, with most of our knowledge informed more by Hollywood than history. In his book Draw, James Reasoner explores the truth behind the stories of these men and their exploits, truths that are often as exciting and interesting as anything Hollywood could ever invent. Reasoner focuses on gun fights, the violence that characterized the lives of these men. Some of these men were out-right sociopaths, killing with no emotion nor remorse, over things as trivial as snoring too loudly (ok, that was an accident, but there was still no remorse). Often motivated by the desire for wealth, many of these men started off on gangs that robbed stage coaches, trains, and banks, but soon events got beyond their control, with posses in chase and life on the run. Some were able to escape justice for a while, settling in another territory or moving back east, but often, the bullet eventually found its target. Draw looks at some of the lesser known gun battles of the Old West, sometimes skipping the more well known ones almost altogether. For example, the shootout at the O. K. Corral is only briefly touched on as part of the context of the death of the one Earp brother who wasn’t there. Not much is made of the two most notorious outlaws, Billy the Kid and Jessie James, except in how their deaths were part of the narrative of other men. Maybe that’s because these more famous events and men have so much more written about them that Reasoner figured there wasn’t a need for even more, focusing instead on the lesser known battles. In any case, the events and men he has chosen are compelling. There are a couple of things I found very interesting. Reasoner tries to emphasize is that the Old West image of two men facing each other on Main Street in a showdown, an image that some historians have said is pure Hollywood fiction, did occur at least a few times. He gives a couple examples of exactly this kind of shootout. Also very interesting is how much New Mexico plays in the history of the Wild West. When we hear of the exploits of Billy the Kid and so on, we don’t have much context for the where of it, just a generic western setting. However, many of these men lived and worked and robbed in New Mexico, as well as Kansas, Colorado, Texas, and California. It makes me want to find some of these places in New Mexico and see what there might be to see. Finally, Reasoner describes some truly remarkable men — on both sides of the law — who, facing a barrage of bullets, kept their cool to gun down their enemies. They let the others wildly shoot away while they steadied their aim and let loose a deadly shot. Fast wasn’t always the most important factor in who won the day. Probably the most interesting aspect of all of this is when these events occurred. These stories involve men who span the worlds of the Civil War to World War I. Many were either Confederate or Union soldiers who moved West to find their fortune. But the last few events described occurred around 1917, near the end of WWI. To me, this was a near epiphany as WWI, having occurred in the 1900s, feels like the modern era, while the Old West seems to be another time. But they overlap. And, indeed, there was less time between the Civil War and WWI than there is now between WWII and our own time. Thus, the backdrop of the Civil War was likely very important context for most of these men, regardless of what side they were on. That, while in Europe men were dug into trenches and airplanes were engaged in aerial combat, men in the US were still robbing banks by horseback is just a bit amazing to think about. I only found one aspect of Reasoner’s writing a bit annoying. In setting up each story, he gives some context to the time and place and more than once uses a phrase such as “The bustling town grew up around the miners who dug their wealth from the ground and the saloon keepers and soiled doves who came to extract that wealth from the miners.” This type of phrase — though probably very accurate — got a bit repetitive, but maybe that shows how similar all of these western settlements were at the beginning. Draw is a very entertaining read and has me looking for more about the Old West.